Nita’s earliest memories of schooling were attending informal lessons at the home of two local spinsters called Misses Girwood, living then at ‘Rosebank’ in the village. Nita remained as their charge for a couple of years but believed her early education there was slow thus causing her disadvantage when moving on to later primary education. The ladies saving grace however was that they knew of her father having been a professional artist. Seeing a talent in her they allowed her time and indeed encouraged her development in this area of expression. Later she was sent to 'Laurel Bank School for Girls' since she did not have the confidence of her younger sister who passed all entrance examinations for Girls High School. This was then a selective fee-paying school where the fees where nominal compared to Laurel Bank much to her father’s chagrin since money wasted was apposite to his nature. She attended Laurel Bank School for girls travelling by train from Mount Vernon to Charing Cross and changing to tram for Hillhead. The school has a fascinating history, reflecting the history of Scottish higher education for women. It was founded by Margaret A. Hannan Watson. In the 1890's when Margaret was in her late teens and studying women students were not accepted at Scottish universities. However, in 1892 St.Andrews University opened its gates to women and she took up this opportunity. Thus Margaret A. Hannan Watson, who taught Nita French language, was one of the first female graduates of a Scottish University. Laurel Bank School was founded in 1903 by Margaret (M.A.1897) and a friend, Janet Spens (M.A. in 1899) a graduate of Glasgow University. Janet was daughter of Sheriff Spens and had also received an excellent education. The school was the first Scottish School founded by Scottish women graduates. By all accounts Margaret Hannan Watson was an outstanding leader who developed a relationship of mutual respect and admiration with her staff and students. She was wholly dedicated to her school and forward thinking in all developments of both class taught and extra-curriculum experiences. Miss Hannan Watson chose teachers not only qualified to the very highest academic standards but also for their practical experience in their field of expertise. Many of the girls achieved academic distinction at university. On leaving school some won scholarships to Glasgow and Oxbridge. Many were awarded prizes in their subjects at university and over the years many became teachers, doctors, scientists, and lawyers. By all accounts Miss Hannan Watson engendered great respect and even awe from her charges. The school was her life’s work and in art as in all subjects she encouraged and fostered the freedom of self-expression. The first chosen member of staff for her art department was the accomplished Agnes Raeburn (1872-1953). She was an RSW. Born in Glasgow she studied at the Glasgow School of Art (GSA) under Fra Newberry from 1887 to 1901. She was a member of the Charles Rennie Mackintosh circle and later President of the Glasgow Society of Lady Artists Club (1940-43). Agnes twice was awarded The Lauder Memorial Prize. Agnes founded the school Sketching Club to help develop artistic ability and entered girls in the Glasgow Corporation Art Competition. In 1916 Fra Newberry generously offered a medal, known as ‘The Newberry Medal’, to be awarded to the most successful art pupil. This continued until his retirement. Bessie Young (1855-1936), born in Glasgow and trained at GSA and Paris. Christine Scott Sloan (1887-1975), born in Glasgow and trained at GSA (1907-15). Muriel Stirling (1889-1940), trained at GSA (1919-22) and Paris. Annabel Kidston (1896-1981), born in Glasgow, studied at GSA under Greiffenhagen (1918-21), Paris and The Slade and was head of art for three years at Laurel Bank. Josephine Haswell Miller (1890-1975) studied at GSA under Greiffenhagen (1909-14) and Paris and London. She was the first women ARSA. Also lecturer in art and architecture at the GSA (1924-32). Mrs Haswell Miller took over the art classes at Laurel Bank in 1926 when Annabel Kidston left to study in London. She introduced etching and dry point to the senior pupils. And retired from Laurel Bank in 1929. Nita's Time at Laurel Bank. Nita's teacher's included Elizabeth C. Kerr for German, Madame Bost for French, Janet Glover (1st class degree Oxford) for history, Miss A. M. Hopper for singing and form teacher D.E. Robertson. School friends included Dorothea Hodge (married Merrydrew), Rosemary Bloom (m.Hulst whom sadly died in September 2010), Jessie Campbell (m.Frame whom sadly died in 2008), and Margot Sandeman (m.Robson, sadly died 2009) who kept in touch throughout their lives. Dorothea Hodge testifies that 'Laurel Bank brought out the best in every girl and nurtured those who had artistic and theatrical talents as much as those of a more academic nature'. Dorothea left school at the age of 15 to study ballet and dance in Edinburgh with the teacher Marjorie Middleton, and then went on to study dance in London with Madame Judith Espinosa. Nita’s opinions of the standards of teaching during her time are very mixed. Memories are of a few poorly disciplined classes where the girls would talk at the top of their voices whilst ignoring the teacher’s attempts to teach. Since Nita was a sensitive child she was affected by any disorder. This made her nervous and worry about her test marks. Suffice to say these would be the classes where marks were lower. Although she had no great feelings of achievement at school she came away with a very good report. She excelled in art studies at school. According to Dorothea Hodge 'Nita had a great artistic gift, which revealed itself right from the start of her time at Laurel Bank. She became well known in the school for her talented artwork'. In her final year Nita was awarded ‘Distinction plus’ for drawing. Her teacher was the highly respected Nell Todd a former pupil and winner of the coveted Glasgow Art Gallery Competition Gold Medal in 1923 and 1924. A gifted original dress designer Nell Todd was an expert needleworker. Nell returned as a teacher and made a great impact on the art department. With high expectations of her students work she was determined to bring out and develop their talents. Nell Todd went on to teacher at the famous Christ’s Hospital Boarding School in Horsham, West Sussex in the 1950’s and 60’s where she was head of the art department. Nita developed a friendship with a French pen pal, Georgette Vachot, with whom many letters were sent and received. Conversing in French they exchanged art postcards and their own poetry. This experience no doubt contributed considerably to her being awarded 'Distinction' for French language by Miss Hannan Watson. 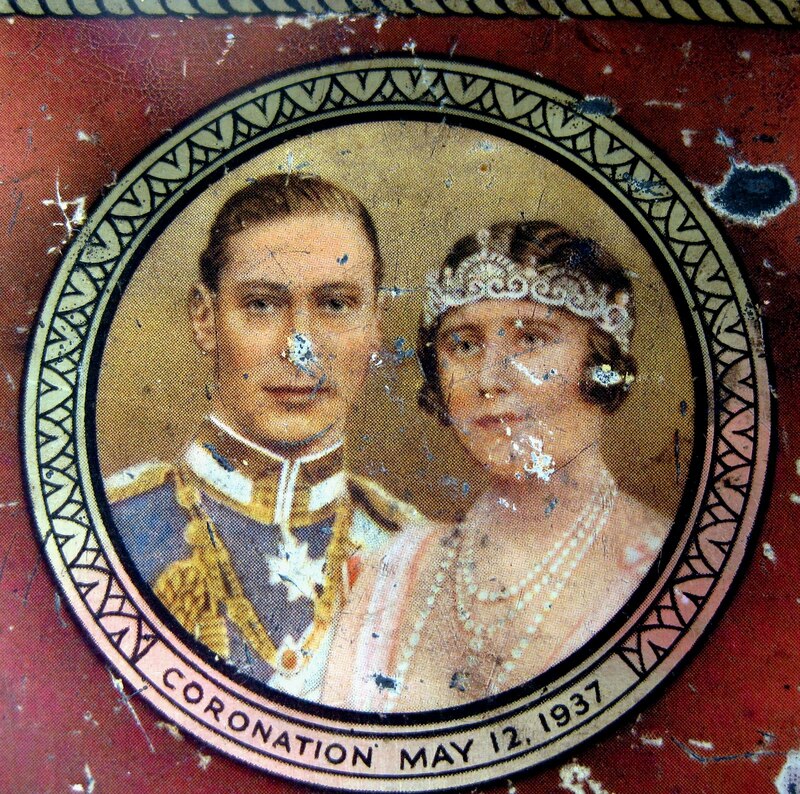 A significant day in Nita's last few weeks of school was the Coronation of George VI in May 1937 Westminster. Every schoolchild in Glasgow was presented with a beautiful little tin of biscuits decorated with a photograph of the King and Queen and inscribed on the underside. 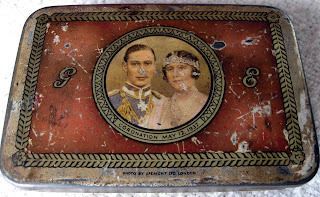 Nita to this day still proudly displays her well-worn tin, however the contents have long gone. In July as the groundwork for the Empire Exhibition began the new King and Queen unveiled the commemorative stone. Nita believed she had no hope of achieving her higher certificate at Laurel Bank and with the agreement of her father left at the end of her fourth year to start the Glasgow School of Art. Having submitted her portfolio and passed her interview she started in 1937 aged just sixteen years old. Nita was renowned for her pigtails.